Telecommunications Consultants India Limited, Is Hiring Eligible People To The Various Posts. So Interested People Can Apply For This Job Through Offline Mode Within The Given Time Period, Which Is Mentioned Below. Engineer – Telecom →01 Vacancy. Telecom Technician Cable Jointer (Fiber optic and copper cable)→04 Vacancy. Telecom Civil / Construction Supervisor→02 Vacancy. Light Duty Driver →09 Vacancy. Helper: Pipe Fabricator (Conduits & Cable tray Fabricator)→03 Vacancy. 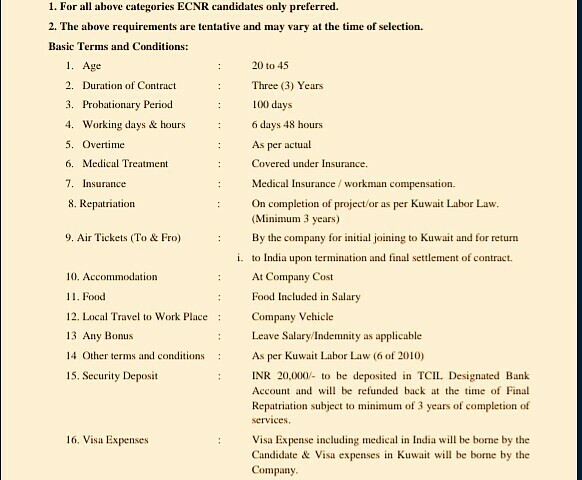 Total Number Of Vacancies →33 Vacancies, Kindly Do Check Out The Image Below For Basic Terms And Conditions. B. Eligible Criteria For Manpower In Kuwait Project Under TCIL Recruitment Notification 2019. Age Limit →20 To 45 Years, For More Details Do Check Out The Official Advertisement. Educational Qualifications →Kindly Do Check Out Official Advertisement. Mode Of Examination/Selection Process →TCIL Selection Rules Applies. How To Apply/Last Date For Online Application Form Submission →Interested candidates should send their applications in the prescribed format to “The Group General Manager (HRD), Telecommunications Consultants India Ltd., TCIL Bhawan, Greater Kailash –I, New Delhi – 110048” up to the last date of receipt of applications....Last Date For Application Form Receipt-12th Of April, 2019. Now Apply For This Overseas Jobs Of Telecommunications Consultants India Ltd.
Click Here To Download Official Notification For Manpower In Kuwait Project . Thank You For Your Support And Love, And Keep Visiting Here For More Abroad Jobs/Overseas Jobs Notification, Till Then Stay Safe And Blessed.